offers a ‘park and ride’ solution, with transport to a bus stop just 100 metres from the Conference Centre. This has been provided by Cape Town’s MyCiTi integrated rapid transit system. Century City is well serviced by various modes of public transport. A primary public transport interchange operates off Ratanga Road, and a second off Century Avenue. Both have designated lanes for minibus taxis and MyCiTi busses, and a terminus building with public toilets, waiting areas, public telephones, a ticket office and vending machines. Commuter buses and minibus taxis are not permitted on the Century City road network. Their operations are restricted to the transport interchanges. The MyCiTi bus provides a link from the Century City Railway Station to a number of convenient stops along the Century Boulevard ring road, and from there, a route via the West Coast line to the CBD. Transport between the CBD and Cape Town International Airport is also provided by the MyCiTi service. Click here for fares and more information on My CiTi Century City. Golden Arrow operates direct bus services to Century City from Cape Town CBD, Khayelitsha, Nyanga, Killarney, Elsies River, Hanover Park and Atlantis. Click here for Golden Arrow Bus service timetables for routes stopping at Century City. Metered taxis are permitted on the Century City road network. A limited number of registered operators have been given staging areas at Canal Walk. Cape Town International Airport is Africa’s third largest airport, and is consistently ranked among the best in the world for service in its category. Awards include Best Airport in Africa for Staff Service Excellence at the 2013 SKYTRAX World Airport Awards, among others. Cape Town enjoys a mild Mediterranean climate, with an average year-round daytime temperature of 17°C. Summers (from October to March) can be hot, with maximum daytime temperatures varying from the mid 20’s to the mid 30’s, with little rain over this period. The south-easterly wind, known as the Cape Doctor, blows fairly often – more so in November and December than in February and March. Days are long and perfect for sightseeing, evening entertainment, sundowners and all-day on the beach trips. During spring (September) and autumn (April and May), days in Cape Town are pleasantly warm, cooling in the evening. Winters in Cape Town (June to August) can be cold and rainy, with occasional snowfall in the surrounding mountains. Go to www.weathersa.co.za for more detailed information and long-term weather forecasts. Century City Hotel is situated opposite Century City Conference Centre. Feel free to visit the Guest Services desk for any accommodation requirements. Closest: Nedbank ATM at Colosseum building next to Colosseum Hotel. The on-site business centre is located on the first floor. We offer exclusive services to our delegates, such as photocopying, faxing, printing, packing, shipping and receiving, and basic office supplies. Computer rentals can be arranged at an additional cost. The Square Cafe & Wine Bar, on the Century City Hotel premises, offers a relaxed, chic dining experience, and is open for breakfast, lunch and dinner. Go to www.squarecafe.co.za for more. The safety of our visitors and staff is our main priority. In addition to the maintenance of closed circuit TV monitoring the CCCC building, parking lots and surrounding grounds, uniformed guards are on patrol 24/7. The first aid room is located on the ground floor. All CCCC staff are trained to assist with first aid requirements. Luggage can be stored at our Guest Services desk on the ground floor. Please ensure that you receive a receipt for your luggage to collect at your convenience. Cellphone services are available inside and around the CCCC. The Conference Centre is equipped with an abundance of charging stations for phones and other mobile devices. Please visit our Guest Services desk to find a charging station that suits you. CCCC Wi-Fi network can be accessed from your computer, tablet or smart phone. Please visit our Guest Services desk if you require any assistance. 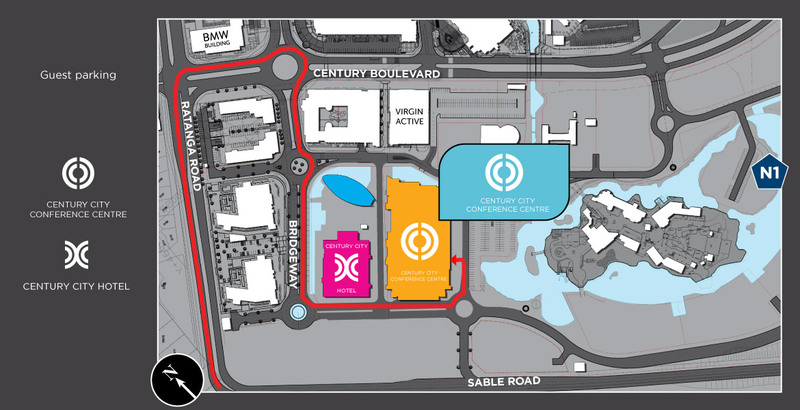 Visitors driving to the Century City Conference Centre will find accessible parking available in the adjacent car park. There are four dedicated disabled parking spaces on the ground floor. Please note that these spaces are on a first-come-first-serve basis. The entrance to the Conference Centre is on the ground floor. Visitors may also be dropped off on Energy Lane, where there is easy wheelchair access into either the Conference Centre or Hotel. The venue is designed for maximum accessibility. Entry though either the parking garage or from the road provides easy access with the floor being designed flush with the Conference Centre and Hotel floor levels. The entrance doors are double automatic doors, and are always staffed when an event is taking place. Our Reception Desk is situated on the ground floor. Our Guest Services team will provide you with local information and assist with any requests for transfers. There is one lift, which is available from the ground floor to the first floor. The conference halls are clearly indicated alphabetically, and the meeting rooms are indicated numerically. There is sufficient lighting provided to ensure maximum visibility. The ground floor foyer is tiled, and all the Conference Halls are carpeted. The first floor foyer and meeting rooms are carpeted. Please arrange any audio or visual assistance with the banqueting co-ordinator. Please arrange any assistance with guide dogs with the banqueting co-ordinator. 1. Opposite Hall C. There are disabled-friendly toilets in both the women and men’s bathrooms. 2. Next to Hall A. Separate Unisex Disabled Toilet. 1. Next to Meeting Room 1. There are disabled-friendly toilets in both the women and men’s bathrooms. The First Aid room is located on the ground floor behind the reception desk. Please contact a Century City Conference Centre staff member should you require assistance. Alternatively, first aid assistance can be called to your location in the building. Local transfer companies are able to provide wheelchair accessible vehicles. Budget offers professional wheelchair-friendly chauffeurs, who are available 24 hours a day, 7 days a week in Cape Town. Contact Budget on 0861 100 424, or email chauffeur@budget.co.za.